Goodreads says, "Winter, 1945. Four teenagers. Four secrets. Each one born of a different homeland; each one hunted, and haunted, by tragedy, lies…and war. As thousands of desperate refugees flock to the coast in the midst of a Soviet advance, four paths converge, vying for passage aboard the Wilhelm Gustloff, a ship that promises safety and freedom. Yet not all promises can be kept. Inspired by the single greatest tragedy in maritime history, bestselling and award-winning author Ruta Sepetys (Between Shades of Gray) lifts the veil on a shockingly little-known casualty of World War II. An illuminating and life-affirming tale of heart and hope." The year is 1945 and many refugees are hoping to board the Wilhelm Gustloff, a ship that will evacuate them from the advancing Soviets. Readers meet four characters all desperate for one thing: freedom. There's Joana, a Lithuanian nurse, who helps so many people along the way, but harbors a dark secret. Florian, a German, but he doesn't let the others truly know who he is. There's also Emilia, a young Polish teenager, who is in her last month of pregnancy and Alfred, a Nazi sailor, who is deeply troubled. Emilia, Florian, Joana, and many other refugees must make the freezing cold trek across Prussia with the hopes to board the ship Wilhelm Gustloff. But things don't come easy for these four very different people and they all must face many hardships. Ruta Sepetys' Salt to the Sea is one of the best books I've read in a long time. It broke my heart over and over again, but it is a story that will stay with me for a long time. 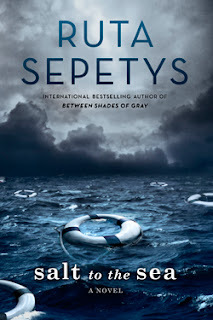 Sepetys switches the points of view between all four characters expertly; however, I felt the best connection with Joana. I admired her skills as a nurse and her moxie. Emilia's situation is also heartbreaking. I couldn't imagine being pregnant as a refugee during WWII. She has so much to face on her own and has been through so much since her parents sent her to East Prussia to work on a farm. Her difficult situation tugged on my heartstrings. I knew Florian was hiding some kind of secret and Sepetys did a great job slowly letting his secret unfold as he became more and more comfortable with Joana and the rest of the refugees. My least favorite character was Alfred, the Nazi soldier, but I think it was smart for Sepetys to share his point of view as it gives us a more well-balanced novel. Alfred is deeply troubled and readers mostly get to know him through the letters he writes to his girlfriend back home. All in all, the characters are really well developed (even the secondary characters) in Salt to the Sea despite the fact that the narration is shared between all four. Let's talk about how Salt to the Sea gutted me. Seriously. How on Earth did I not know about the Wilhelm Gustloff tragedy? Why isn't it talked about more? I was completely blown away and I'm so thankful to Sepetys for bringing this to my attention. To remember is to honor and that is essentially what Sepetys is doing here. The time period of WWII has always been very fascinating to me and Sepetys brings to life this tragedy so well that I won't easily forget this novel. Salt to the Sea is really powerful; it's an important novel and one that will make you think. It wasn't easy to read in certain parts, because it was so heart-wrenching, but I think that is what make it so unforgettable. It's mind-boggling that this tragedy occurred and that people's lives were cut short from this senseless tragedy. I thank Ruta Sepetys a million times over for writing Salt to the Sea and I know that I, for one, will not forget what happened to the many children and refugees aboard the Wilhelm Gustloff. Wow, this one sounds gloriously brutal emotionally Christina, and like you, I've never heard of the Wilhelm Gustloff tragedy. I imagine we're not alone in that particular ignorance, so I'm glad this book is out there! It's a bit heavy for me at the moment, but it's on my list for when I don't need the death grip I have on my light and fluffy phase anymore:) Gorgeous review! I am so glad that this book educated me on this topic as well...so important! You definitely have to be in the mood for this book. I hope you can check it out soon. Thanks for visiting, Jenny! I have not read a Ruta Sepetys book yet, but I have heard such amazing things about her writing. This one is on my shelf and I am hoping to pick it up very soon, I think I'm going to love her stories! I hope you get to read her soon...she's amazing! You'll love her novels. Thanks for visiting, Andrea! I loved this one! I completely agree. I read it in a little over a day and it was so heart-wrenching and compelling. I think Joana was my favorite character as well but I also felt for Emilia and her situation. I didn't know about the Wilhelm Gustloff either and this book was such an eye-opening look at the tragedies that were all over during WWII. Great review! Yes, Emilia's situation was a tough one. I didn't know about it either! I felt like I really should have though, so I am glad I read this book. Definitely eye-opening...I agree. I'm glad you feel the same way, Cassi. Thanks for visiting. Oh I'm loving the sound of this one! I love historical fiction especially set in this time. Me too, Joy. It's a powerful read for sure.. I think you'll enjoy it. Thanks for visiting! This is the second 5 star review I've seen today! I may have to check it out, even though it's way out of my normal zone. Great review! Yes, it's been getting incredible reviews. It was definitely an upsetting read at times, but I think it's a really important one and well worth it. I hope you can check it out soon. Thanks for visiting! I am seeing so many rave reviews for this one and I'm feeling more and more like I need to drop everything and get to reading it NOW. It is strange that this event is not more widely known! I can't wait to find out more and meet these characters. You definitely need to read it, but it will break your heart, so be prepared. I can't wait to hear your thoughts on it, Becky! Thanks for visiting. Iam currently reading this one, agree with your review so far! Will update again.